Are California homebuyers getting squeezed out of the state? 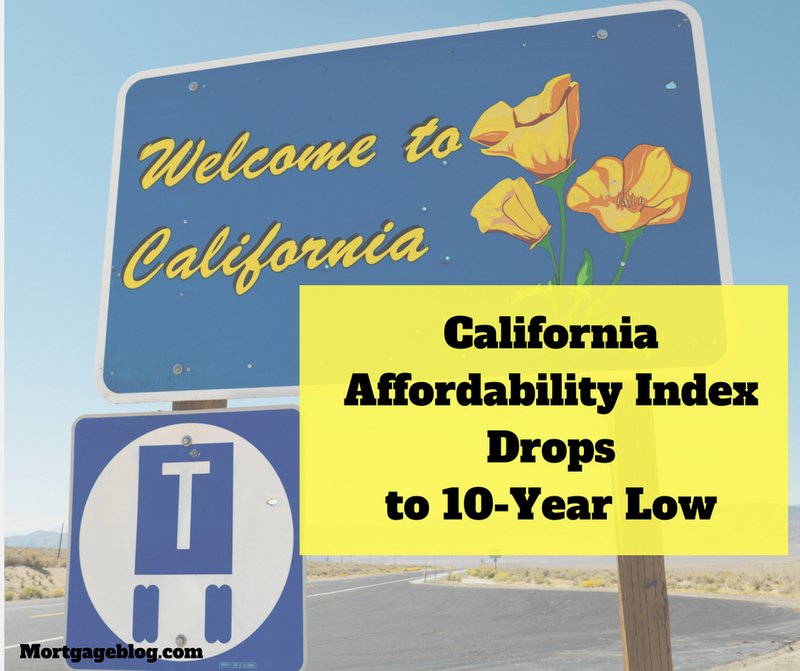 In early August, the California Association of Realtors (CAR) released its’ housing affordability index for the second quarter of 2018. 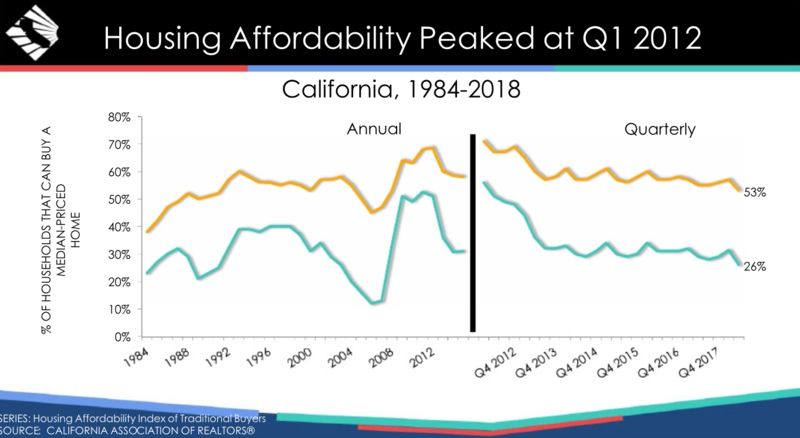 The major takeaway offered by CAR in the report is that the combination of increasing housing prices and rising mortgage rates have reduced the home buying affordability in the state to the lowest level in 10-years. In the first quarter of the year, 31% of California homebuyers could afford a home in the state, but by the end of the second quarter, it fell to 26% of all Californians, according to CAR’s Traditional Housing Affordability Index (HAI). This is even a reduction from the second quarter of 2017, which came in at 29%. How does that translate into your monthly mortgage payment (including taxes and insurance) and the income you would need to qualify if you purchase a home at California’s median price of $596,730? With a 20% downpayment on that purchase price and a 30-Year fixed rate loan averaging 4.7%, the full payment would be $3,160/month and you would need an annual income of $126,490 to qualify. On a regional level, among the San Francisco Bay Area counties, both San Francisco and Marin counties improved from 2017. This is attributable to the increase in wages. 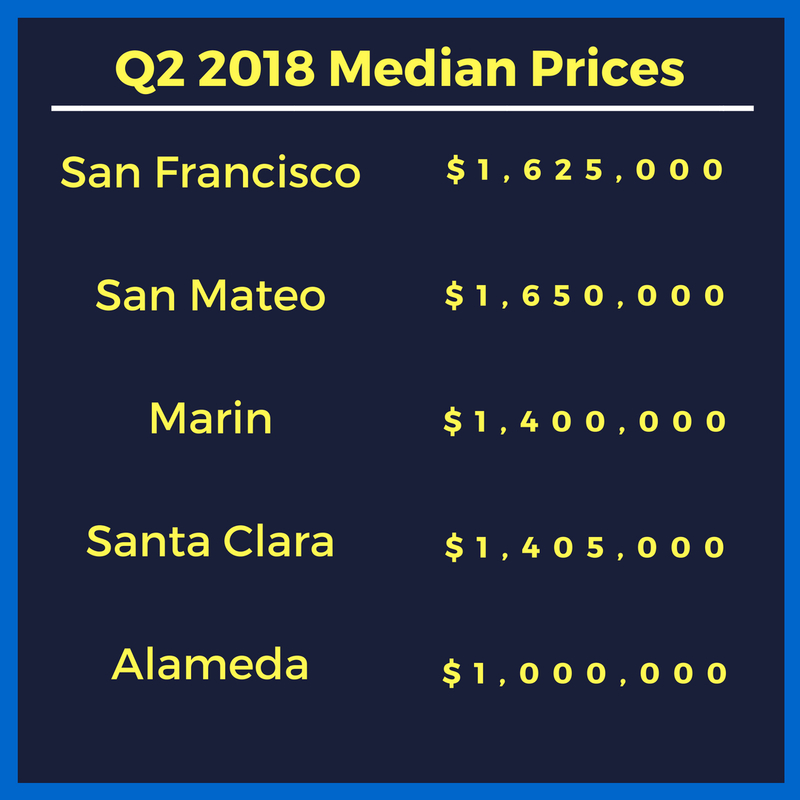 At the same time, affordability fell in Alameda, Contra Costa, Santa Clara, Solano, and Sonoma and held steady in Napa and San Mateo counties. While in Southern California, affordability improved in Ventura County but decreased in Los Angeles, Orange, Riverside, San Bernardino, and San Diego counties. During the second quarter of 2018, the most affordable counties in California were Lassen (64 percent), Kern (53 percent), Madera (52 percent), Tehama (51 percent) and Kings (50 percent). 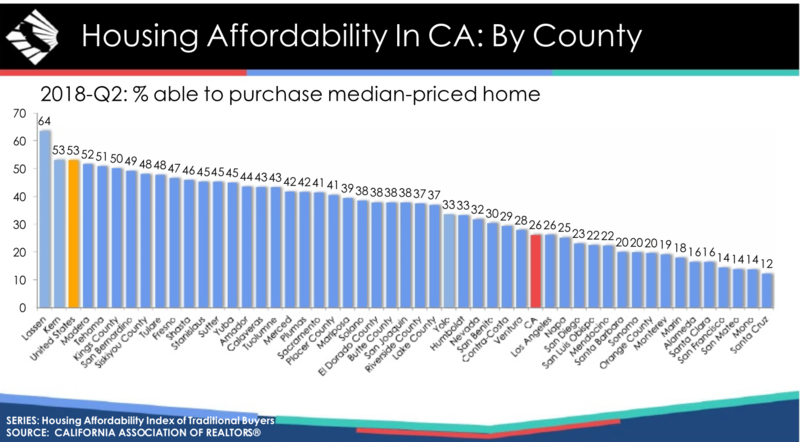 Santa Cruz (12 percent), San Francisco, San Mateo, and Mono (all at 14 percent), and Alameda and Santa Clara (both at 16 percent) counties were the least affordable areas in the state. Affordability also declined for Condominiums and Townhomes in Q2 2018. Only 36 percent of California households could afford a median-priced ($477,790) condominium/townhome. This is a drop from 39% in the first quarter of the year. It would require an annual income of $101,270 to qualify for a mortgage of 80% of the purchase price of a median-priced home. This is an increase of 127.9% over the minimum income required to qualify for a median-priced condominium/townhome, statewide, in Q1 2012. CAR’s data reveals that the increase, statewide, in income required to qualify for today’s median-priced single family home is 124.6% higher in Q2 2018 compared to Q1 2012. Or $126,490 today versus $56,230. In the San Francisco Bay Area, there’s been a 142.8% increase in minimum qualifying income since Q1 2012. The swing is from $90,370 to the current level of $219,380. The HAI report also breaks down the increase in Monthly PITI (principal, interest, taxes, and insurance) from the Q2 2012 to Q2 2018. For single-family homes, statewide, it’s increased 124.1%, and for condominiums/townhomes, it’s increased 127.9%. In the San Francisco Bay Area, it’s increased 142.5% compared to 109.7% for the Los Angeles Metropolitan area, and 78.8% in the U.S.
You can read the full HAI report on CAR’s website, here.